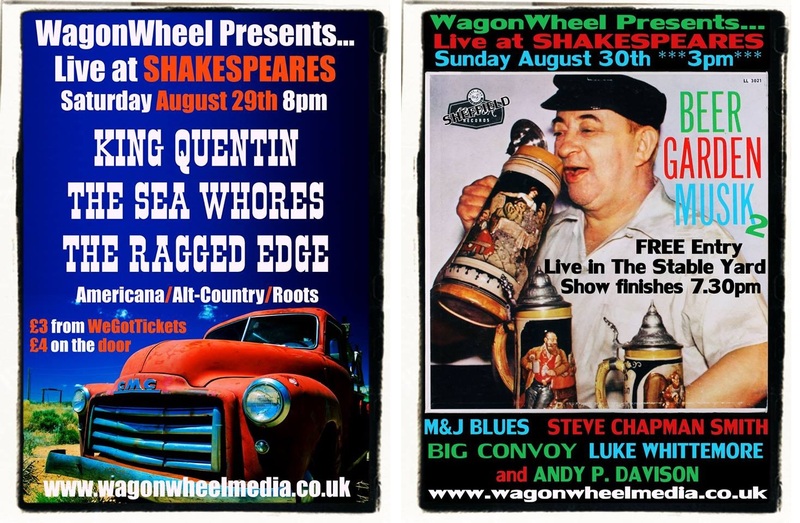 Well Tramlines seems like an age ago, but WagonWheel Presents… finally returns to action this weekend with a double header of shows at Shakespeares. Saturday night it’s our usual haunt of the Bard’s Bar for our last Saturday of the month show with King Quentin, The Sea Whores and The Ragged Edge. On Sunday we take to the beer garden for an afternoon show with M&J Blues, Steve Chapman Smith, Big Convoy (acoustic), Luke Whittemore and Andy P. Davison. Entry to Sunday’s show is free and the music starts at 3pm. Saturday night will cost you just £4 (or £3 & a bit if you buy in advance) and doors open 8pm. The respective previews for these shows can be found here and here. Our next stop at The Greystones is on Tuesday September 8th with The Rosellys + Mat Wale & Friends. You can read all about this one here. Fingers crossed for sunshine on Sunday (we’ll be inside if not). Maybe we’ll see you there?